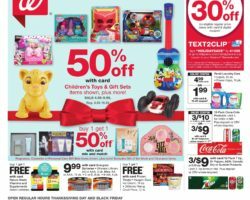 Check Walgreens Black Friday 2018 Sale, valid Thursday, November 22 until Saturday, November 24, 2018. Save with this year Walgreens Black Friday deals on: Yankee Candle Holiday Scented Candles (2-pk. ), Squishmallows Plush 16-in, Detergent or Fabric Softener, M&Ms, Wonderful Pistachios, Nature Made Vitamins and Supplements, Single-Serve Coffee K-Cups, Nescafe Instant, Nestle Semi-Sweet Morsels and more. Check out the Walgreens Weekly Ad Circular & Flyer Deals. Save with this week Walgreens Ad, beauty sales, printable coupons, weekly circular prices, and current specials. Walgreens is the second largest pharmacy in the country and it sells a big product mix including fresh packaged foods, snacks, drinks, baby supplies, cosmetics and personal care, prepared foods, and carries a liquors section at select locations. The pharmacy also operates an online store and provides additional online-only deals. Delivery for online orders is free for purchases $35 and more and Walgreens has free in-store pickup service for customers who would like to shop online and save on delivery. Typical Walgreens promotions include buy 2 get 3rd item free, free name brand gift with qualifying purchase, 20% off specified category, and bonus weekly deals. Walgreens specials usually vary from BOGO offers for vitamins to buy one get one 50% off select cosmetics and personal care, 2 for $3 candy, 2 for $4 protein bars and much more. Customers who shop with card enjoy lower everyday prices and more coupon discounts for in store and online purchases.